If you live anywhere near a body of water, whether it be a lake, ocean, or river, the best thing you could do for your child is to teach them to swim and provide them the opportunity to enter the world of stand-up paddle boarding. Stand up paddle boarding is a great activity for keeping the kids out of the house and active within nature. SUP boarding is easy to learn and adds strength and endurance to a growing young adult and is a great way to enjoy a nice summer. 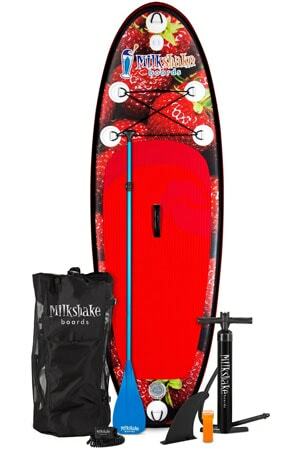 Milkshake paddleboards are beautiful with unique designs that your kids will absolutely love. They are easy to ride (…) and the little learner will have an easy time staying on board. There are many different SUP rental companies throughout the country if you want to try before you buy, but ordering a board online is affordable and easier than ever. 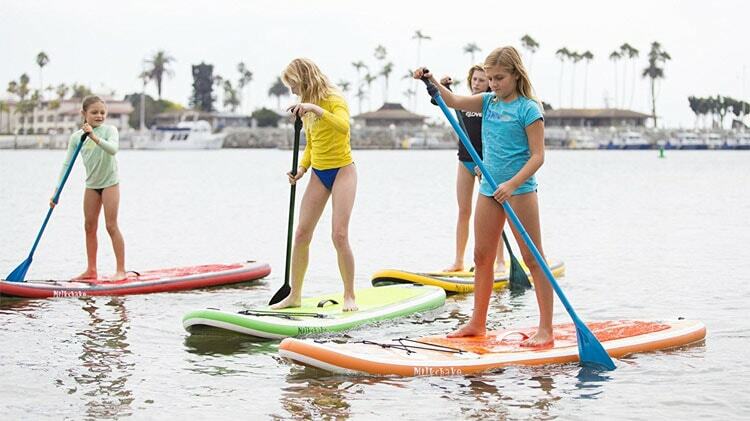 With the consistent growth of kids’ stand-up paddleboarding, there is a substantial variety of fiberglass as well as inflatable and soft top SUP boards for children. Finding a youth stand up paddle board is simple if you are looking in the right places. Feel free to browse and compare our list of top-notch kids’ paddle boards that are available today, and see which model, design and dimensions best fit the style and needs of your child. 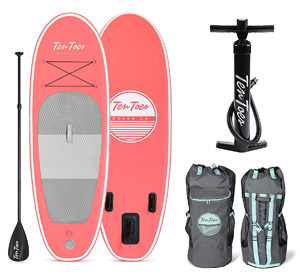 8' x 30" x 4"
8'7 x 26" x 4"
7'8 x 28" x 6"
7' x 30" x 6"
The Ten Toes 8’ x 30” x 4” inflatable kids stand up paddle board is an affordable package great for siblings who want to take to the water together. With a variety of board design colors to choose from, your son or daughter can pick between Pink, Green, and Black/Red colors. Vibrant and highly visible, the Nano model is constructed with highly durable military grade PVC material to withstand minor scrapes and punctures. 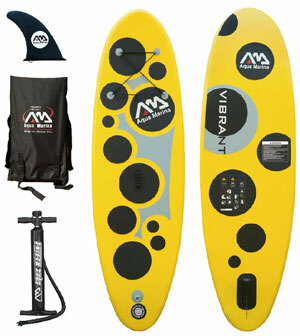 This board is suggested for calm waters and can easily float riders up to 120 lbs. The Nano has a gray built-in diamond cut deck grip and the center handle provides an easy carry for the lightweight inflatable constructed paddleboard. A cross-section bungee is included for strapping down a life jacket, lunch box, or small cooler, and a D-ring is installed on the square tail of this board so you have the option of attaching an ankle leash for quick board recovery and support. All color variations have the Ten Toes logo across the upper center of the board and across the bottom surface. This board is easy to transport and rolls up with ease for compact storage. Package includes adjustable 3-piece paddle, front bungee strap, 3 removable nylon fins, manual pump, and repair kit. Users say that the Ten Toes 8’ Nano board is great for their young ones. It is super solid in water, just like a traditional board. It is very fast and can stand rough conditions. The only downside seems to be the quality of the paddle; a few riders are not sure how long it can last. For the youth paddle boarder looking for a chilled-colored and traditional shape in their next paddle board purchase, they can find simplicity in the cool-tone blue and aqua colored True Wave 8’0 Youth Junior Stand Up Paddleboard. 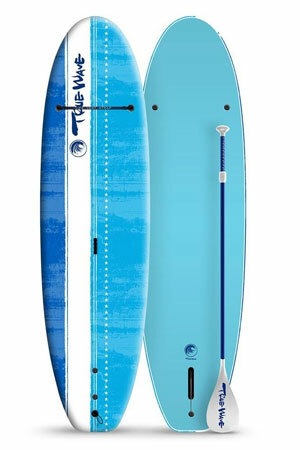 Extremely affordable for all skill levels, the True Wave has a round nose, squash tail shape with a soft-top construction atop of an EPS core 3-stringer system. With a removable single fin system, the True Wave is extremely lightweight at 12 lbs and is easy to transport to and from the shoreline. The soft top offers great traction with the under-deck traction pad and has a single bungee strap across the upper center for strapping life jackets or other accessories. The aqua bottom surface appeals to the rider who wants a tropical style to their ride and the different shade of blue and solid white stripe offers great visibility and a unique personal style. A center molded grip handle makes for quick and easy transportation, and a leash plug located on the tail provides an easy attachment for the leash of your choice. Most customers bought the True Wave Junior for their kids or grandkids. It has proven to be the perfect gift. The size and volume suit the young ones. The adjustable kid paddle is a great bonus. The Aqua Marina Vibrant is well suited for its name because of its vibrant black and yellow color. Given the measurements, 8’7” x 26” x 4”, this board is best suited for kids. Aqua Marina is a well-known brand and has shown itself to be reliable over time. Like all great kids’ iSUPs made to last, the Aqua Marina is made of very tough PVC material using the famed Dropstitch technology to ensure durability even in unfavorable conditions. You do not have to stop your kids from being wild and adventurous (as long as they adhere to safety rules, of course) because this inflatable board can stand any use and abuse. Included in the package are a fin, a backpack and a starter pump. The pump can easily inflate the board up to 15 PSI which the recommended pressure. These extras would have otherwise cost you money so you could thank Aqua Marina for that. The 4” thickness of the board ensures that the rider stays afloat. Thinner boards are barely able to stay on the water making the entire experience very annoying. The non-slip deck pad design is not like that on other boards. Although it covers less space, the pattern is convenient for the young paddler. There are bungee cords strapped to four stainless steel D-rings at the front and a leash D-ring located conveniently towards the tail. The Aqua Marina is a great gift for any kid. Users are pleased that it tracks well and is great for learning on. The colors and design are appealing to young riders. The only disappointment shown by users is due to lack of a paddle in the package. No one can resist the charm of the Airhead Popsicle. The engineers behind this board had one goal on their mind; to make paddleboarding as safe and as fun as possible for the young determined paddler. The Popsicle iSUP has four fixed fins so no one will be losing their fin or going through the trouble of fixing fins and removing fins—you only need to inflate and deflate. The SUP bundle includes a tow ring, a board strap, a mesh backpack and a hand pump with a pressure gauge. The mesh backpack allows the board to air dry when stored. The EVA traction pad covers almost the entire deck surface and has a tail kicker. It is soft and prevents slipping. It features a rocker both at the rear and front for smooth handling. In addition to all this, the Popsicle is light enough to have the kid carry their own board. The Popsicle, although small, performs better than bigger boards. It is especially better for young SUPers because they have no problem controlling it. It is stable and pretty solid on water. The top-rated 8’2″ x 29.5″ x 4″ Liquid Shredder Soft Top children’s stand up paddleboard offers great stability and flow for the various skill levels of riders who are looking to stand out with a vibrant colored paddle board. The well-rounded Liquid Shredder contains a full yellow base color with a white gridded deck grip for the maximum hold while riding small to medium sized waves or cross lake excursions. The black colored rails are a nice touch that makes the vibrancy of the yellow surface pop with visibility and the Liquid Shredder logo is bold and visible in the upper center of the rounded nose. The patented soft vinyl surface area offers a maximum cushion for riders up to 180 lbs in weight, and the center handle grip makes carrying this kids’ stand up paddleboard to and from the water easy with a weight of only 19 lbs. A thruster tri-fin system is included with the purchase and offers more stability and handling when riding the waves or cutting through the water. A dual aluminum stringer is used for the interior construction of this soft top and adds to the rigidity that is meant to withstand the elements of the sun and water without any chance of any material delimitation. The oversized EVA deck pad offers amazing traction. This board comes as is, and does not include a full package. The Shredder is the perfect board to be seen on and with its vibrant color, riders will have the luxury of high visibility which is great for parents who like to keep a close eye on things. The Liquid shredder is an amazing board for the young ones (and lighter people). According to users, the best features include ease of carrying and its ability to track in water—thanks to the tri-fin system. Milkshake paddleboards are made specifically for kids and they will motivate them to have a lot of fun during summer for hours on end. They are beautiful with unique designs that your kids will absolutely love. They are easy to ride even for first-time paddlers. Their stable base and grip deck ensure stability and the little learner will have an easy time staying on board. A center handle on this Xterra board for juniors makes carrying it across the beach less strenuous. There is an elaborate bungee system for fastening necessities securely. Xterra figured that a smaller paddle would be easier for your young ones to control hence the convenient dimensions (96 x 30 x 4 inches) of the Milkshake paddle board. This board has an integrated special air-intake system which, together with the included pump, enables the kids to inflate their own boards with little effort. Made of the military grade PVC, your kids are sure to enjoy themselves without worrying about dents and dings. The package is pretty attractive. Besides a colorful Xterra Milkshake board, you will get an adjustable paddle, a backpack, removable fin, repair kit and a leash. Users say that their kids find the Xterra easy to use and maneuver. First-time paddlers managed to attain and maintain balance in their very first ride. Inflation is easy enough for the little ones. They also love the premium bundle very much. The Bright Blue8’3” for kids is a board made with so such expertise using Military grade PVC and Dropstitch technology. No condition can put dents and dings on this board. It has been able to withstand impact from tough materials like rocks. For learners, the non-slip EVA pad will ensure secure footing and keep your young adventurer from slipping. It is also soft and forgiving to the feet or knees. The pad is large enough and covers most of the deck. The Bright Blue slices through the water smoothly owing to its dimensions, 8’3” x 28” x 4”, that favor the paddler that loves speed and maneuverability. The tail fins contribute to this feature and enhance the performance of this kids’ iSUP. There is a convenient bungee system towards the nose for fastening personal items and a D-ring at the tail for the leash. 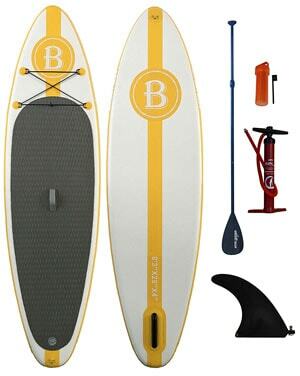 The package includes a Bravo manual pump, a paddle, a repair kit and a detachable center fin. The paddle is 3-piece and adjustable from 66.93” to 88.58” and has an ergonomic handle for a comfortable grip. The Bravo is a dual action manual pump that will automatically switch to single action at high pressure. The Bright Blue 8’3” is awesome for kids, according to the customers. It is easy to inflate and maneuver. The anti-slip pad helps to prevent kids from slipping and keeps them comfortable as they enjoy the water. It tracks well. Moreover, you can install a kayak seat on it. 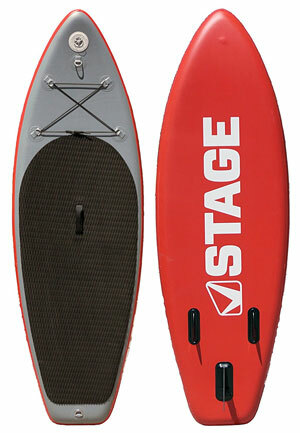 The Stage Junior iSUP is the ultimate paddleboard for the kid who cannot get enough of the water. Made for little champions, it has a shape that provides for speed, if need be and easy maneuverability. This being an inflatable paddleboard, it is lightweight and easy to handle in terms of storage and transport. Inside the box, you will find the Stage Junior SUP, 2-stage manual pump, a 3-piece adjustable aluminum paddle, a backpack, a leash, a removable fin and a patch kit. This is a bundle you cannot turn away from because it includes everything that is needed for paddling. You can receive your package and hit the water on the same day. There is a bungee system near the nose (fastened to four stainless steel D-rings), a tow ring at the nose and a leash D-ring at the tail all for convenience. The deck is covered with a diamond EVA traction mat that enhances grip while remaining soft enough for comfort. The carry handle located at the center makes carrying the Stage iSUP to the water easier. 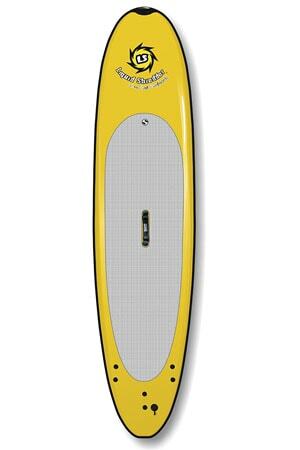 The inflatable SUP features 3 fins, one toolless removable fin, and two fixed smaller ones. Although it is not from a renowned brand, the Stage Junior has made its mark in the industry. Users say that it is outstanding on water and kids can easily use it. The paddleboarding bundle has saved some money and time, and they are happy. 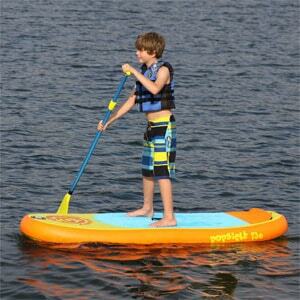 If you are wondering which paddleboard will bring out the pro paddler in your kid, try the Sapient Grom. The board is wide and the rider will have plenty of room to move around—which also makes it great for SUP Yoga. It is an all round board with cool colors (white/grey/blue). The 8’ length is easy to maneuver for any kid without straining them. Because it deflates and rolls up, kids can carry it on their own when going to the beach. 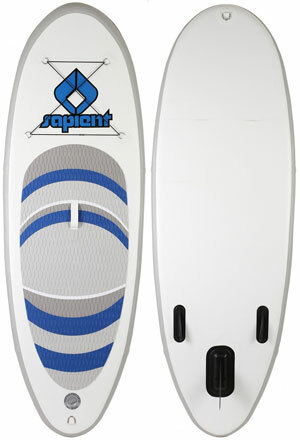 The Sapient Grom features a three-fin system which enhances and speed. Like most inflatable paddleboards, it has an EVA pad that prevents slippage when the board is wet and offers a comfortable surface for the kid’s feet. The Sapient Grom performs very well on water. The fin system enables it to slice through the water with ease. The width makes it convenient for Yoga. The NRS Youth Amp 9’2 x 29” x 4” is the ultimate kids’ iSUP board for intermediate to experienced riders. The sleek style of this youth inflatable paddle board consists of dark shaded black and gray colors for the oversized scale skin/diamond cut grip deck. The board design bursts with a sunset colored pattern across both top and bottom surfaces. A center handle piece produces an easy carrying technique and two upper center rail handles are included for easy grasping and transportation in and out of the water. The NRS printed logo is at the bow of the board and the Amp model print is printed on the grip pad for a stylish sporty look. A D-ring for leash attachment is installed on the tail as are four D-rings in the upper center for bungee strapping your personal items. This board is the perfect size for riders weighing up to 120 lbs. A great board for younger riders to grow into, the NRS Amp offers efficient stability and cuts through the chop without a problem. The NRS Amp comes standard with a single fin and is a fantastic board for cruising around, catching some waves, or riding the white water. Its construction is made with a PVC drop-stitch material which offers max rigidity at 15- 20PSI. 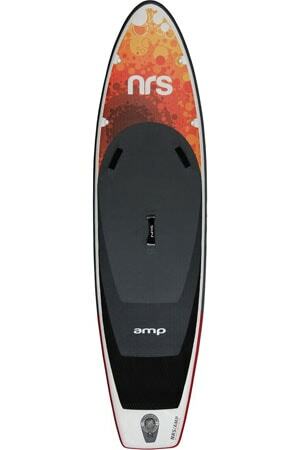 If you want a standout and sports-style paddle board with great versatility, the Amp was made for you. The NRS Youth iSUP does look good and the users have confirmed that. When inflated to 15PSI, this inflatable board is very stiff and does not sink in the middle. The backpack is of high quality. Kids do not have to sit idle at the beach as you paddle or share a board with you just sitting on the deck. Buy them a kids paddle board and create memories as you SUP together along your favorite routes. All the paddles highlighted above are of outstanding quality and can guarantee you a great time. Be an unstoppable team of SUPers together with your kids or grandkids.